Alzheimer's Association caregiver support groups, conducted by trained facilitators, are a safe space for caregivers, family, and friends of persons with dementia to build support system with people who understand. It allows participants to exchange practical information on caregiving challenges and possible solutions, talk through issues and ways of coping, share feelings, needs and concerns, as well as learn about community resources. The support group meets each month to encourage caregivers to maintain their own personal, physical, and emotional health, as well as optimally care for the person with dementia. 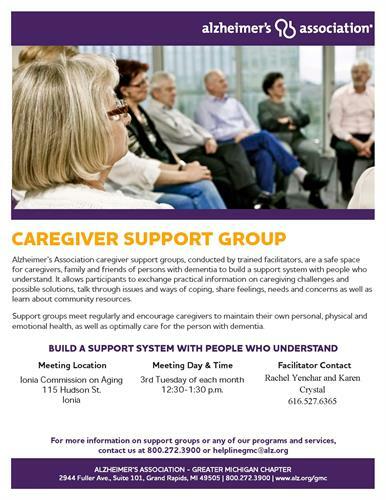 The Caregiver Support Group meets every 3rd Tuesday of each month from 12:30-1:30pm at the Ionia County Commission on Aging Senior Center, 115 Hudson Street, Ionia.